I’m rather glad now that I didn’t know a week or so ago that Jen William’s The Copper Promise had been previously published as four e-book only novellas. Call me a literary snob, but it would likely have put me off trying the new release of the four parts drawn together into one thumping great paperback. Weighing in at a hefty 500-plus pages, it is Tolkienesque in size if not so much in content. (And that is not a criticism – after being force fed Farmer Giles of Hamm in school, it soured any enjoyment that may have been left to find in reading Tolkien’s other books). While not a great reader of the fantasy genre, I can confirm that this book has the expected swords, sorcery and quests, but it also has rather a lot more. Young Lord Aaron Frith is a man out for revenge. He limps one evening into a somewhat disreputable tavern with an aim of hiring two mercenaries, Sir Sebastian Caverson and his companion Wydrin, commonly nicknamed the Copper Cat owing to both her red hair and her agility in a fight. Generally considered to be amongst the best sell-swords around, despite their love of the drink, the pair will happily provide their considerable skills to anyone who can provide the coin to keep them in beer for the foreseeable future. As a lord – albeit a scarred and ragged lord with a very large chip on his shoulder – Frith can certainly provide them with a good amount of coin. With a deal struck and pints drunk, the trio make their way to the Citadel, once the magnificent home to last of the mages, but now a dangerous ruin guarded by the local authorities to prevent yet more foolish adventurers from coming to a sticky end within. Frith will not be stopped by such trivialities; he finds what he seeks beneath the ruins and a lot more besides, in the shape of the last of the old gods, Y’Ruen. Awakened and freed after many centuries of imprisonment by said mages, Y’Ruen takes a dragon form and sets out to wreak destruction on the world that trapped her. Frith meanwhile, apparently oblivious to the dangerous forces he has unleashed, heads off to pursue his revenge, leaving the dragon to play on the consciences of Sebastian and Wydrin. They know they must stop her, but it is a risky business and they are not even going to get paid for their troubles. Your first reaction at reading the synopsis about might be to say that you have heard it all before. That was my first thought too. I spent much of the first section of the book wondering how on Earth I was going to finish several hundred more pages about adventurers on a quest after a dragon. Well, once the dragon is freed, so is William’s imagination and she gives us a very 21st century type of fantasy story, with the more traditional elements you might expect neatly interwoven with many new ones that bring a fresh relevance to the novel. There are good, strong female characters and the reason that Sebastian was thrown out of his old knightly order is one that may well have made Tolkien blush. Characterisation was rounded throughout, the story was for the most part well-paced and absorbing, and although there were one or two overly silly bits and minor plot holes, it was nothing to take away from the overall enjoyment I had from reading it. 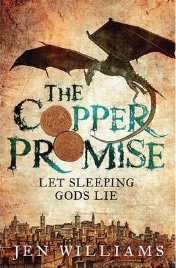 The Copper Promise is not hard-core “geeky” fantasy; it is accessible to wide audience and I expect it will find a lot of appeal amongst readers who wouldn’t normally bother with anything labelled as fantasy. Williams sets the story up nicely for a sequel at the end, so hopefully this is not the last we will see of Frith, Wydrin and Sebastian. With thanks to the publishers for providing me with this review copy. No Comments on "The Copper Promise"